Having adequate housing provides personal security, health and dignity and is a fundamental human right to all (UN-Habitat 2009), which legitimately satisfies the needs of a household and offers legal protection against forced evictions. The housing sector in Uganda like any other developing countries has undergone a paradigm shift since independence, from state sponsored, to neoleberalism (private sector provision) but the low-income population still suffers from a huge housing deficit especially in urban areas. 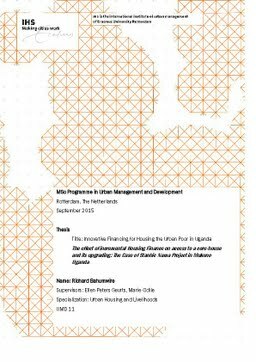 Lack of innovative and appropriate housing finance mechanisms, which are tailored to incremental housing processes, have aggravated the low-cost housing deficit in Uganda. It is against this background that this research sought to answer the question: “What is the effect of incremental housing finance on access to a core house and its upgrading? In answering this question, a desk based review of related literature, which developed a theoretical framework for this research was undertaken followed by the field study that was conducted in the Stanbic Nam project in Mukono Uganda. Thesis Advisor Peters Geurts, E., Odile, M.